Head west on US-12 W/Phillips Blvd toward Lueders Rd, Turn left on Hwy-60, Turn right on Co Rd B, Destination will be on your right. FVP is a diesel performance and repair facility specializing in tractor and truck pulling diesel fuel injection, fuel supply, turbocharger, water injection, and data acquisition systems parts. We are also a master distributor for diesel pickup truck performance products and accessories. We also service, repair, and overhaul original equipment (stock) diesel fuel injection systems, turbochargers, and diesel engines. Our service bay activity includes agricultural tractor, construction, and diesel pickup truck diagnostic and repair. Cummins 8.3L dropped a valve seat, FVP replaced the cylinder pack. 2014 Dodge tuning and delete. Custom build Cummins 4BT cyl P7100's. Custom bent a set of lines, updated turbo for a pulling truck. 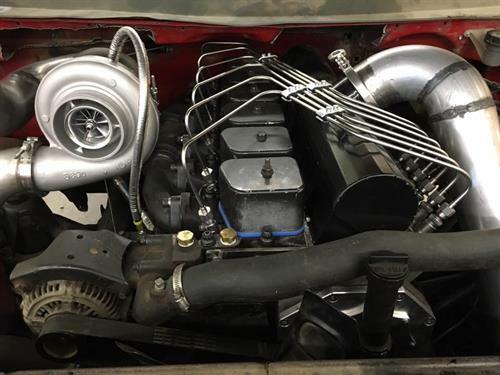 FVP built the P7100 injection pump, injectors, & turbo.